The only way to organize your closet is to pull everything out. Everything needs to come off the rack, shelves and floor. This is where you’ll be able to make a total assessment. You might also discover a lot of things that you forgot you had plus some items you could do without. Depending on the closet, you might have to rotate your clothes. A smart way to sort them is by season. You’ll know when to make the shift as the temperature changes. You could also separate your clothes by their purpose. There could be a section for work, one for casual and one for dress up. Joan Crawford had this one right! You should get rid of all your wire hangers. They’re not to do your clothing any good. Instead of throwing them out you might want to recycle them or give them back to the dry cleaner. A tie rack isn’t just for ties. It’s also great place to hang scarves or belts. These racks usually go on the inside of the door. Find the one that fits them best for your needs in terms of size and how many items that can hold. The one thing that causes the most clutter in your closet are the shoes. They should have their own rack on the floor and each shoe pair should have their own distinct place. Yes, it’s so much easier to kick off the shoes into the closet but that is not going to help you stay organized. Besides, the same effort it takes to kick off your shoes you could use to put them in the right place. For bulky winter sweaters and coats, consider vacuum sealing. There are some great options for this type of storage that could allow you to pack up a lot of items and slide them under your bed. Once you start the vacuum seal, you might not stop! As you start to put stuffed back into the closet in those organized categories, you might be left with a lot of things to toss out. This is where Junk King Seattle comes into play. These the junk removal professionals that have a lot of experience with this type of clean up. You don’t have to bring any of your stuff downstairs. Instead, leave it right on the spot in the team Junk King Seattle will happily pick it up and loaded onto the truck. If the items are still usable though make sure they get dropped off at a local charity. They can also clear out the rest of your unwanted items throughout the house. 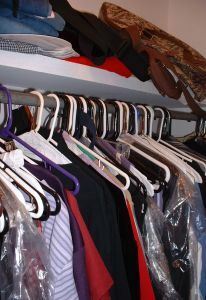 You’ll soon discover that Junk King Seattle is going to be a big help with your closet organization project. This entry was posted in Seattle Junk Removal and tagged closet, clutter, Junk King Seattle, organize, rubbish on June 28, 2017 by Junk King. Last updated June 28, 2017 .